Delegating the amplification duties to a separate component allows the AV7005 to keep a healthy distance between noise-inducing high voltage/high current circuits and sensitive low-level circuits. This means that the radio frequency and electromagnetic interferences that must be tamed in a receiver simply don't exist in a pre/pro, or are reduced by several orders of magnitude. The result is less distortion and less signal degradation in general. Aesthetically, the AV7005 is a sophisticated – and totally successful – exercise in minimalist design. At first glance, you'll see just two knobs, the iconic Marantz porthole-style display, and a smaller On/Standby button. Naturally, this elegantly simple front panel integrates with any décor. But don't mistake the AV7005's true personality. Look closely at the centered display first used on the Marantz Model 9 power amplifier. It provides an "at a glance" status check on input selection and gain setting. Immediately under this display, a drop-down door hides a vacuum fluorescent display, as well as secondary controls and connectors. Barely 16" deep from front panel controls to rear panel connectors, the AV7005 fits where other preamp/processors often can't – on a shelf or in a custom cabinet, and can be rack mounted using the optional rack mount kit RMK8003AV. The AV7005's audio circuitry includes our proprietary HDAM (Hyper-Dynamic Amplifier Module) circuits and Current Feedback topology. Even vinyl aficionados will welcome the AV7005 as it includes a highly musical MM phono input implemented with the same current feedback technology that provides seamless octave-to-octave tonal balance for line-level inputs. HDAMs combine the short signal path advantages of ICs (integrated circuits) and opamps (operational amplifiers) with the superior sound quality of separate circuit components. Because HDAMs are discrete designs, Marantz engineers are free to choose the parts best able to preserve the sonic details of your favorite sources. Marantz's M-DAX 2, an updated and refined version of the original Marantz Dynamic Audio eXpander, calculates just the amount of high frequency information typical file compression formats remove – and then restores it so you enjoy full fidelity when playing back MP3 or WMA music files. The AV7005 makes your home entertainment world far, far larger than you imagined. In addition to conventional sources such as Blu-ray players and set-top cable/satellite boxes, the AV7005 preamp/processor gives you easy ways to listen to the music you've already stored on an iPhone or other portable music player, show your photos on the big screen, stream audio from a wide variety of sources, and enjoy music from your Bluetooth-enabled devices wirelessly with the optional RX101 module. The AV7005's Ethernet connection is DLNA (Digital Living Network Alliance) 1.5 and Windows 7 compliant. This means it's easier for you access and enjoy digital music from your PC. Enjoy the world of wireless audio the AV7005. Just plug the optional RX101 Bluetooth module into the AV7005's rear panel M-XPort connector and enjoy traditional Marantz sound quality from your favorite Bluetooth-capable sources such as iPod, iPad and smart-phones. The AV7005 handles all of today's most advanced surround sound formats. You'll find a full roster of Dolby technologies such as TrueHD, Digital Plus, Pro Logic IIz, IIx, II, Virtual Speaker, and Dolby Headphone. From dts, we've included HD Master Audio, High Resolution Audio, ES Discete6.1, Matrix6.1, Neo:6, 96/24, Express, and Neural Surround. Regardless of the audio format chosen by a content provider, the AV7005 will handle it. In addition to these surround formats, you'll also find Audyssey's MultEQ XT Auto Calibration, MultEQ Pro for custom installations, Audyssey DSX, Dynamic Volume, and Dynamic EQ. You can use the full array of Audyssey technologies to tame your room's acoustic anomalies, preserve a source's full dynamic impact even at low volumes, and compensate for those "too loud" commercials that often intrude on your listening and viewing pleasure. (High Definition Multimedia Interface) has become the de facto standard for connecting components in today's best home entertainment systems. The AV7005 fully supports the latest 1.4a version with six inputs (one on the front panel) and two outputs. You'll enjoy the convenience of single-cable connections, the latest 3D technology, an Audio Return Channel, and Standby Pass-Through. In addition, HDMI 1.4a supports a host of other performance enhancements. The ABT2015 10-bit processor, Anchor Bay's fourth-generation video engine, provides exceptional performance including transcoding, deinterlacing, and scaling to give you the flexibility and convenience once restricted to video professionals. Easy selection. Easy customization. Easy operation. Those are the benefits of the AV7005's new color GUI (Graphical User Interface)/On-Screen Display. Simplified yet comprehensive menu screens, liberal use of color, and consistent navigation commands make it easy to choose the performance parameters you want and integrate the AV7005 with the rest of your system. For multi-zone operation, you can select different audio sources for Zones 2 and 3, even add a different composite or component video source for Zone 2. There are configurable 7.1 preamp outputs – both single-ended and balanced – as well as a second subwoofer output particularly useful in large rooms. With 56 AM/FM/HD tuner presets (eight stations in each of seven groups) you can memorize your favorite broadcasts, even those from the Internet, for easy and repeatable access. The AV7005's HD Radio allows you to access FM that sounds (almost) as good as CD and AM that often outperforms conventional FM. Ready for satellite radio? So is the AV7005. Simply add a Sirius home docking station (and a subscription) for a wide variety of exclusive programming. The AV7005 delivers state of the art level of performance and flexibility that has distinguished Marantz products for more than 50 years. Technology and tradition. 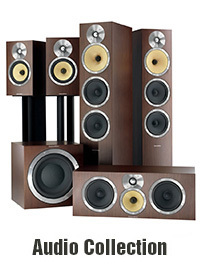 These are Marantz trademarks and your assurance that the AV7005 will truly enlarge your world.